TOKYO, Sept 30, 2011 (AFP) - Japan's industrial output rose less than expected and household spending plunged in August, data showed on Friday, amid concerns slowing demand could hamper the nation's fragile post-quake recovery. Worries for the health of the world's third-largest economy have increased as exporters face a soaring yen that eats into repatriated profits and as demand softens both at home and abroad amid fears of a global recession. 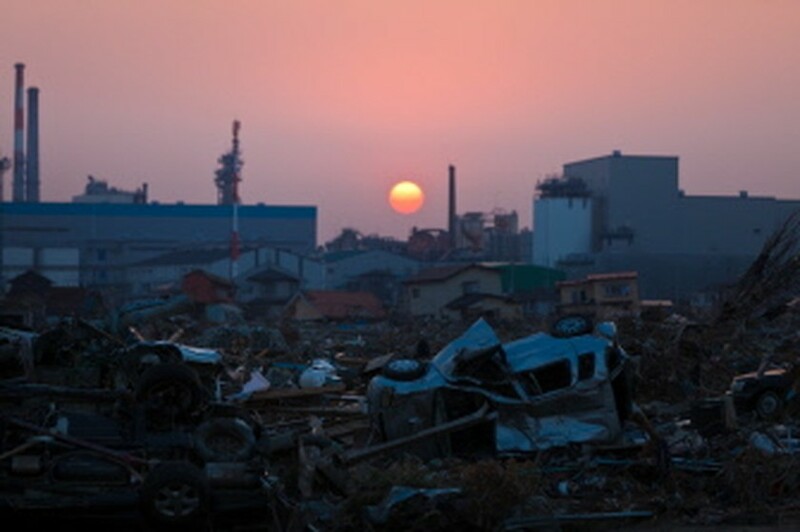 AFP file - In a file picture taken on April 13, 2011 the sun sets over debris still piled up nearly five weeks after the earthquake and tsunami disaster devastated the city of Ishinomaki in Miyagi prefecture. Such factors are seen as undermining Japan's recovery from the March 11 disasters that left 20,000 dead or missing and triggered meltdowns at the Fukushima Daiichi nuclear plant 220 kilometres (138 miles) northeast of Tokyo. Japan's factory production rose by 0.8 percent in August on-month, the fifth straight monthly gain since plunging in the wake of the tsunami that crippled component supply chains and led to the shutdown of factories. But the data missed expectations of a 1.5 percent gain. Meanwhile consumer spending, accounting for just under two-thirds of the economy, continued to slide. Friday's data showed household spending fell 4.1 percent in August on-year, missing forecasts of a 2.9 percent fall. "We cannot be optimistic about the outlook," said Yoshiki Shinke, chief economist at Dai-Ichi Life Research Institute. "Japanese firms are cautious amid uncertainties overseas and a stronger yen." The Ministry of Economy, Trade and Industry said that production "has almost recovered from the Great East Japan Earthquake" but warned that "it would be necessary to keep watch on future developments." Producers polled by the government expected output to fall 2.5 percent in September before rebounding 3.8 percent in October, amid concerns over the eurozone debt crisis and a US slowdown. Output tumbled by a record 15.5 percent in March following the earthquake, while household spending fell 8.5 percent, helping push Japan into recession. In August, workers' households spending on automobiles dropped by almost two-thirds and appliance purchases dropped 40 percent, partly due to the lower TV sales that had surged ahead of the end of analogue broadcasts in Japan in late July. Data on Thursday showed Japan's retail sales fell for the first time in three months during August, partly due to the effect from lower TV sales. Meanwhile base salaries declined by an average 1.7 percent. "Sales of digital TVs fell back after getting support from the transition to digital terrestrial transmission in July," said Shinke. "Employment and wages are not expected to grow so consumer spending is highly likely to slow down as such temporary factors disappear." Analysts say the latest data illustrate the fragile state of Japan's economy and will spur opposition to the government's plan to raise taxes to help fund reconstruction from the March 11 disasters, amid fears it could hit growth. Separate government data on Friday showed Japan's core consumer prices rose 0.2 percent in August from a year earlier, beating market expectations of a 0.1 percent increase. The core consumer price index, which excludes volatile food prices, has risen in part due to an increase in energy costs, but Japan in general remains mired in a deflationary trend of falling prices. Separately, Japan's jobless rate stood at 4.3 percent in August, down 0.4 percentage points from the previous month, the government said Friday. The reading excludes figures from the disaster-hit northeast of the country. The market had expected the rate to be flat at 4.7 percent.